This Morrocan pouf cover is made from a patchwork of Quadrille fabrics....I spot many of my favorites. What a brilliant idea by Etsy seller MarleyMaterial. If you have $475 burning a hole in your pocket, consider spending it here (keep in mind that Quadrille fabric is really pricey). 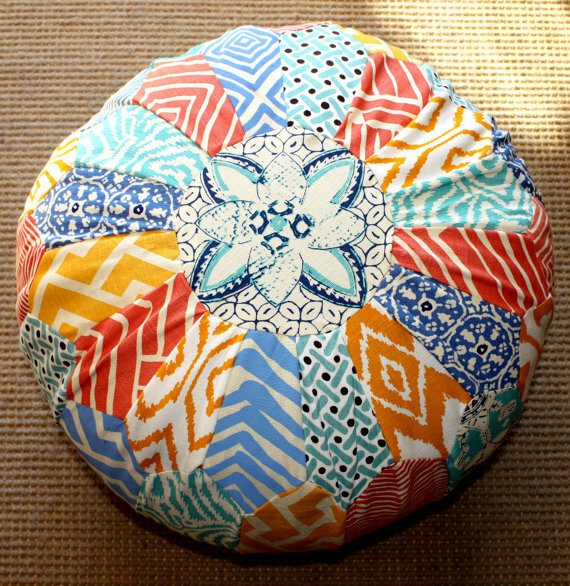 I love the idea of making one's own Moroccan pouf, and this may inspire me to try it. However, I would limit it to one or two fabrics. This looks way too homemade and crafty, in a bad way. Marley Material is one of my favorite Etsy stores -- I've featured it several times! She always has incredible things! What an adorable pillow! That would be great to do with any leftover samples you might have! We have a ton of Quadrille on our site and it's so nice to see something so different done with it!